Puree the peaches and mango with the lime juice and ½ cup of simple syrup. Add the vodka (you won’t taste it, but it will keep ice crystals from forming in the sorbet). Taste and adjust sweetness with more simple syrup (will vary depending on sweetness of the peaches). Add ginger ale to make 5 cups. Process in an ice cream machine according to manufacturer’s directions. Mix even quantities of water and sugar in a small saucepan (ie. 1 cup of each). Bring to a boil and stir until all the sugar crystals are gone. Let cool before using in sorbet. Keep leftover syrup in the fridge for up to 2 week. You can use this basic recipe to make all kinds of fruit sorbets. Most ice cream makers take about 5 cups. When I make grapefruit sorbet, I juice about 4 cups of fresh juice, and add 1 cup of syrup (again, depends on the flavor of the grapefruit). Fresh strawberry or strawberry mango sorbet is also delicious! 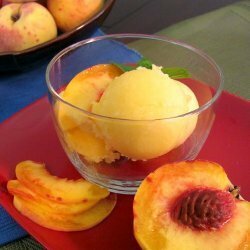 The mango in these recipes enhances the other fruit without being a noticeable ingredient – I don’t even like mango on its own, but in sorbet it is excellent! ← Finger and Palm Painting! National Craft Day!